Current in a circuit is driven by voltage differences. Imagine you would disconnect the point Q from ground. Then it is clear that the battery drives a current $I = 0.5$ A from "+" to "-" through the resistors, and there is a voltage drop $\Delta U = R\times I$ across each resistor in the circuit. However, in this setting, it is undefined, what the potential difference between point Q and ground is. It could be any arbitrary value. When you connect Q to ground, then you define the potential difference between this point and ground to be zero. This will not affect the voltage difference between "+" and "-" of the battery, hence the current in the circuit stays the same. But it defines the potential between "+" and ground, and between "-" and ground. For example, without the ground connection the voltage between "+" (point P) and ground could be 110 V, and that between "-" (point S) and ground could be 100 V. With the ground connection, the voltage between "+" (point P) and ground is +2 V, and the voltage between "-" (point S) and ground it is -8 V, such that the voltage between point Q and ground is zero. It appears that you are asking why it is that the answer is not option $C$ on the assumption that if the current starts at the positive terminal of the battery (node $P$) it then flows through the $4\,\Omega$ resistor and out through the earth contact at node $Q$ so no current flows through the other two resistors? 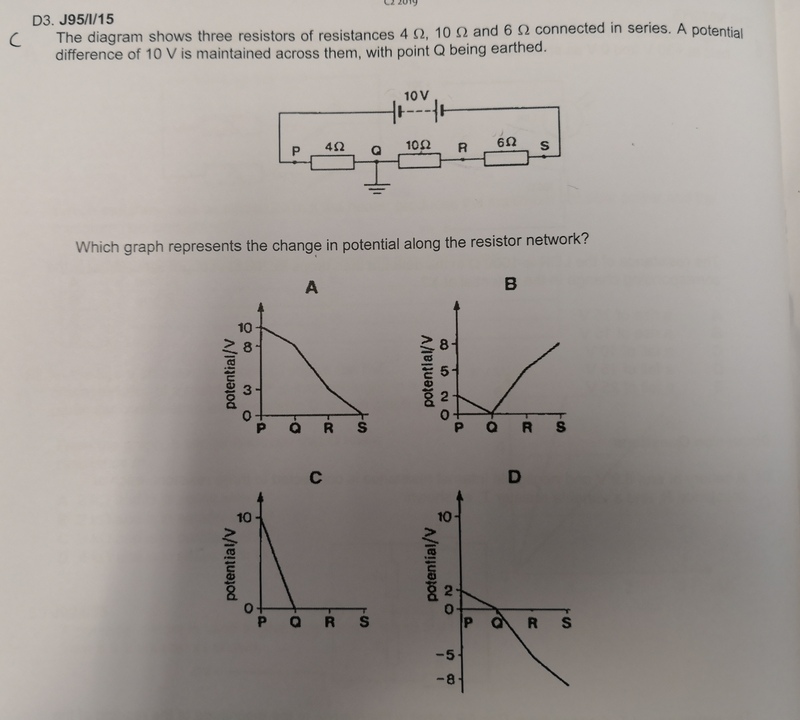 If this is a conventional circuit then the current is actually a flow of electrons coming out of the negative terminal of the battery and flow from right to left through the resistors. Using your logic there would be no current through the $4\,\Omega$ resistor! However it is the conservation of charge (Kirchhoff's first law) which gives the simple answer. The current out of the positive terminal of the battery must equal the current in to the negative terminal of the battery as there can be no accumulation or loss of charge within the battery. If some current leaks out of the circuit through the earth connection at node $Q$ how does that current get back into the circuit to make sure that the currents in and out of the battery are the same? In this problem the purpose of the earth label at node $Q$ is to give you a value for the potential of node $Q$ so that then the potentials of the other nodes can be assigned. I think this is an exercise in high school. Your question is why does not the current leave the circuit and enter the ground. And the answer is that the current will continue to flow through the circuit. No current in the circuit means any two points on the wire are at the same potential because it is a conductor. But we know that it is impossible for there is a fixed 10V difference between the two points of the battery. This is the only possible state the circuit should be at. And is the answer to this exercise. However, you may ask, why the current should be continuous when the system get static? That is because if it does not, the battery will accumulate the charge by time or lose charge. If it accumulates the charge and gets a higher potential than other parts, the electron (with the negative charge) will be attracted to the battery (Coulomb interaction) and then it cannot gather more charge, vice versa. This looks like the current is continuous in macroscopic. You may also ask, why the system must get the static state. And the answer is similar to the one to the question above, there is a negative feedback in the system because of the electric interaction. The point is that in metal (in fact the conductor), the electric field will drive the electrons move. In the classical view, electrons meet the ions and the interaction between them is similar to the damping of the water flow. The electric field driving and the damping force lead the system to static at last. It is similar to the behavior of 2nd order equation: $x''=F-x'$ , or the motion of an object under wind resistance. Finally, why there should be earth connects to the point Q? In high school exam or homework, it performs the reference level of the potential: 0V. Sometimes it is also an infinity charge pool. You may meet such exercise in the future study and it should not bother you. Not the answer you're looking for? Browse other questions tagged homework-and-exercises electric-circuits electrical-resistance voltage batteries or ask your own question. Can the Hall effect drive a current? Why is current the same in a series circuit? Can someone break down what exactly happens in this situation? Will any charge flow in this circuit? Does this kind of circuit work? Why does the LED turn off if the high current is going through the short? How Ground wire triggers breaker?